Fight Hate with Peace. Love Trumps Hate. In the wake of the election and its results the country saw an outburst in hateful harassment, from swastikas spray painted on cars to hateful notes stating ‘Make America White Again.’ According to the Southern Poverty Law Center there were 867 cases of hateful harassment or intimidation in the U.S. just during the ten days after the election. It is important to show those who feel emboldened by hostility that we will not give in to hate. The Women’s March on Washington will follow in the peaceful footsteps of so many civil rights marches before it. Their website cites some of the principles of Kingian non-violence, "The nonviolent approach helps one analyze the fundamental conditions, policies and practices of the conflict rather than reacting to one’s opponents or their personalities." Reproductive Rights are at Stake. We Trust Women. President elect Donald Trump made some troubling promises and comments during his election campaign. With his promise to repeal the Affordable Care Act comes the looming effect of repealing its coverages of women’s birth control and prenatal care. He also spoke strongly about nominating Supreme Court Justices that would overturn Roe v. Wade. Trump has also made promises to defund Planned Parenthood, which is already banned from using federal funds for abortion services. All the cut would do is deprive individuals from access to contraception, cancer screenings, STD testing and treatment, etc. Reproductive rights are inherently our own as women. Marching on inauguration day will show Trump and his administration that they will not be taken from us. For Our Future. The Future is Female. Millions of little girls and young women growing up in the United States will look to our president for guidance and as a role model -- Donald Trump has demonstrated time and time again his sexist behavior and lewd views on women in general. March to show the girls and women of our future that they matter and they too have to power to change this country’s future. Along with Donald Trump’s lewd and sexist comments were a slew of racist and islamophobic statements made throughout his campaign. His characterization of undocumented Mexicans and Latinos as ‘rapists’ and ‘criminals’ and his administrations over-willingness to link Islam to radicalism has made many feel uncomfortable to say the least and unsafe. The Women’s March on Washington is about unity of all people standing up and refusing to be oppressed. To stand together in solidarity for women’s rights means we will also stand together for the rights of all people and causes. Exercise Your First Amendment Right. We Will Not Be Silent. The first amendment gives us the right to free speech, petition, religion, press and assembly. Too many people get caught up in speech and not enough in action. This is an opportunity to legally and lawfully stand up for your rights. A mass assembly of people sends a message to the administration and all who support it: We will not be silenced. Protection of Sexual Assault Survivors. Still Not Asking For It. Given that Donald Trump was accused of sexual assault and will soon hold office, many survivors feel unsafe and left behind. Marching for women’s rights would send a message to survivors of sexual assault that they are not alone and that there are others in this country that care about their protection and well-being. Meet Other Organizers/Organizations. No One is Free When Others are Oppressed. The effort to stand up for women’s rights does not end when the march ends. Every day in communities across the country there are local and national organizations working towards a common goal. Coming to the Women’s March on Washington is a great way to network and meet organizers from all over the country. BUST will be there on January 21, interested in meeting up? Our bus is currently sold out, but join our Facebook Event for updates on how you can join us on the day. Much thanks to our bus sponsor, Black Phoenix Alchemy Lab, who is a huge advocate for feminist media and women's rights. Black Phoenix Alchemy Lab hand-blend their cruelty free perfumes and products to create a dark, romantic gothic tone. 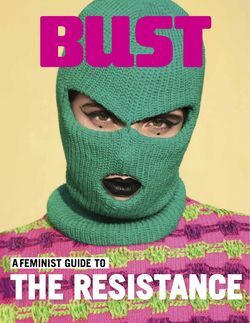 BUST Magazine Needs Your Help!